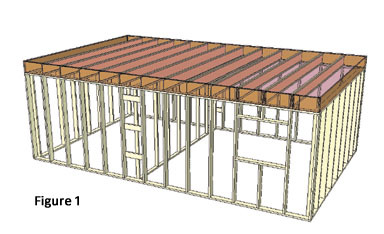 Wall Framing -- what holds up the roof??? Some houses have walls built of logs, poured concrete, hay bales, or even rammed earth. But most residential housing uses balloon framing which was developed in the mid 19th century and propelled forward with the development of plywood in the mid 20th century. 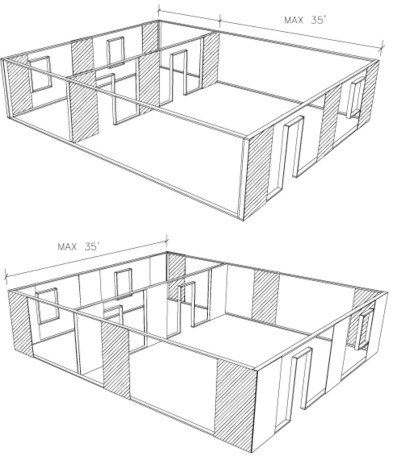 These walls use studs (2x4 for interior walls and usually 2x6 for exterior walls) spaced 16" or 24" on center. 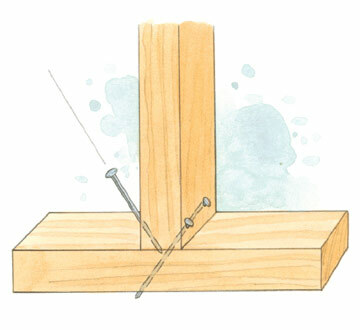 Since floor joists are also spaced 16" or 24" o.c., these studs (placed vertically) usually stack which means they are in alignment with the floor joists below and with the roof framing members above. In essence the wall is a sandwich with a single plate at the bottom, studs in the middle, and two plates at the top to lock corners and join wall segments. Meet the stud. 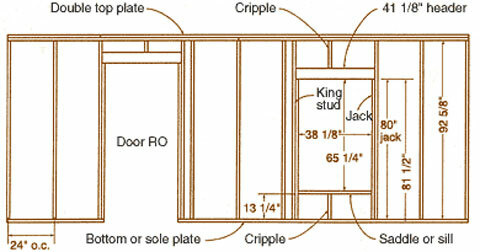 Studs are vertical and pre-cut to a specified length. For a wall measuring 8' high the stud length is 92 5/8". The studs follow a pattern of either 16" or 24" on center spacing. Windows and doors are laid out within this layout pattern. Header. When there is an interruption in the stud layout pattern by a door or window, something has to carry the load of the roof above on load bearing walls. This is the job of the header. The size of the header increases as the span increases since a greater span requires greater strength. 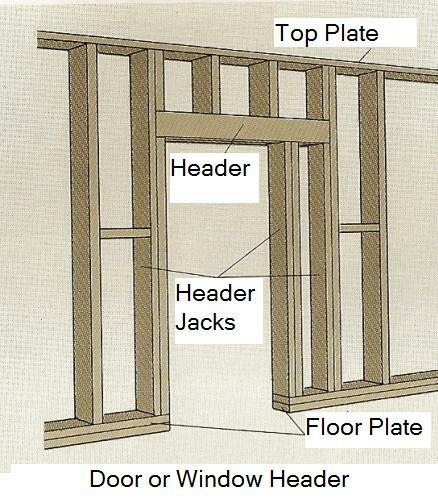 Jack Stud: jacks hold up headers on windows and doors. King Stud. A king stud runs plate to plate, has the header fastened to it and is attached to the jack stud. Cripple. The cripple fills space between the header and the top plate or between the window sill and the bottom plate. Their primary purpose is to carry point loads and provide nailing for sheathing and sheetrock. Blocking. Blocking is added to provide solid backing for attaching cabinets, hardware, or curtain rods to the wall. Imagine an upper cabinet 42" long on a 24" o.c. wall. It would only be held up by a single stud at one point and could come crashing down. Blocking is normally flat and horizontal. A special application is fire blocking to block air drafts and the spread of fire in enclosed walls around stairways. Nailing. Studs are normally end nailed through the sill plate with two 16 penny nails and through the top plate with two 16 penny nails. The bottom plate is toe nailed to the deck. Then sheathing is applied to the wall. Sheathing is usually 1/2" cdx plywood or 7/16" osb strandboard which come in 4' x 8' sheets. Then the wall is tipped up into position. Corners are nailed. Wall is nailed to deck and braced. Then the top plate is added to lock all corners together. Wall is straightened using a string line spaced away from the wall with a block. Added braces are set to maintain straight string lines and ensure a straight wall. Here you are looking at a wall corner from the top. 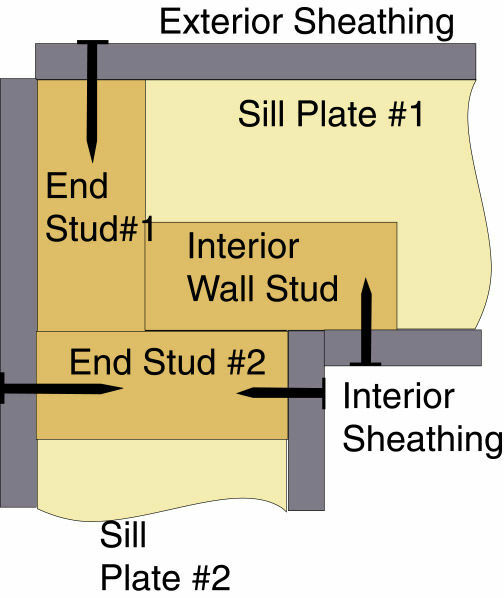 This is a 3 stud corner that provides nailing for the sheathing (end stud#1) and nailing surface for the inside corner sheetrock (Interior Wall Stud and End Stud #2). Each end stud has a sill plate and a top plate. The second top plate locks the corner together as well as nails connecting Interior Wall Stud and End Stud #2. Wall bracing is about keeping houses from blowing in the wind. 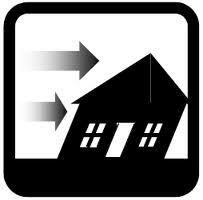 A waterfront home might be subjected to 80 or even 120 mph wind. 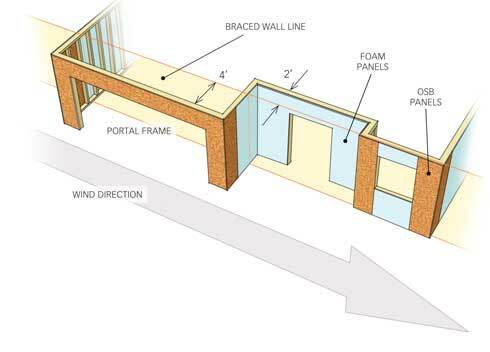 You can brace a wall by having wall brace panels located in corners and every 25 to 35 feet as shown in the diagram to the right. Sometimes the brace is a plywood or osb nailed panel. It can also be a let in brace of wood or a metal strap nailed diagonally. Areas around garage doors have special pre-engineered panels that when you use the specified stud spacing, nail pattern and tie downs can reduce the size of the wall section to 24 inches. A wall panel less than that will trigger engineering which means you take the project to a structural engineer or an architect and pay for his licensed report. Normally a wall brace panel is required within 72 inches of a corner. Walls that are within 48 inches of each other and parallel are part of the same wall when calculating bracing. Standard brace panels go from plate to plate and are 48" wide. Building jurisdictions have pre-engineered instructions which let you build a panel that is only 42" But on garages we have traditionally allowed 24" panels. On the right is a pre-engineered prescriptive path for getting a two foot panel to work on garage openings. Note the straps which are embedded into concrete. Also note the very tight nailing pattern and the tripling of the sill plate to add rigidity. While this seems extreme, imagine a powerful wind gust or a severe earthquake. This is how we can be assured a building envelop that will maintain it's rigidity in unusual environmental conditions.